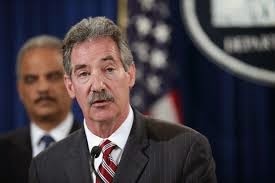 On Thursday, James Cole, the top deputy at the Department of Justice and one of those under consideration as a replacement to the resigning Eric Holder, suddenly announced his resignation. The timing is more than slightly curious. It came immediately following the release and analysis of documents which show that two Americans were injured in 2013 by a weapon which was part of the DOJ’s Mexican cartel armament scheme, Fast and Furious. Judicial Watch forwarded the documents to Senator Charles Grassley (R-IA) and Congressman Darrell Issa (R-CA), the chairman of the House Committee on Oversight and Reform. The documents show that two people were wounded in a Phoenix-area crime in which a weapon purchased by a Fast and Furious operative was used. On Thursday, Issa and Grassley notified Deputy Attorney General James Cole of the linkage between the weapon, their gun-running adventure and the two injured Americans. A short time later Cole announced his resignation, stating as his reason an apparent urgent desire to work in the public sector.